ALVA, Okla. – Maverick Harper is as confident as he’s ever been in his rodeo career, and it comes at a good time. 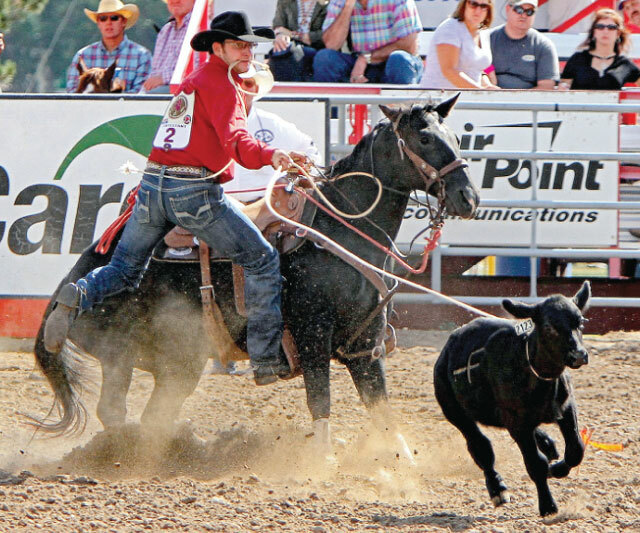 The Northwestern Oklahoma State University cowboy is competing at the College National Finals Rodeo for the first time, and he likes the opportunities that are before him when the action takes place Sunday, June 10-Saturday, June 16, in Casper, Wyo. But it’s not just an individual confidence; he sees great things for both the Northwestern men and women’s teams. Harper, a senior from Stephenville, Texas, won the team roping-heading title in the Central Plains Region, joining his heeling partner, Tanner Nall of Colcord, Okla., for the top spot in the circuit made up primarily of college teams from Oklahoma and Kansas. Harper also finished second in the region’s all-around race, so he will also compete in tie-down roping at the college finals. He and Nall will be joined in Casper by tie-down roper Ethan Price of Leedey, Okla., who finished second in the region. Also in the mix are a trio of steer wrestlers: Talon Roseland of Marshalltown, Iowa, the regional champ; Cody Devers of Perryton, Texas, who finished second; and Bridger Anderson of Carrington, N.D., the fourth-place bulldogger. For the women, Jenny Massing of Ponoka, Alberta, finished second in both goat tying and the all-around race, so she will also compete in barrel racing. Taylor Munsel of Arnett, Okla., finished second in breakaway roping, while Brandi Hollenbeck of Hutchinson, Kan., earned the spot on the team by finishing fifth. Sara Bynum of Beggs, Okla., won the regional title in barrel racing and hopes to carry over that success to Casper. She blazed through the 10-event season on her talented 8-year-old paint mare, Loretta. Bynum knows her success runs through the talented horse’s legs. She also realizes what kind of talent will be wearing those black and red NWOSU vests. “Having a full team back at the college finals says a lot about Northwestern rodeo and about Stockton (Graves, the rodeo coach),” Bynum said. “He does a very good job recruiting, and having a full team back at the finals gives us a chance to do well as a team. The CNFR finalists earned the right to compete in Wyoming by finishing the region race among the top 3 in the standings. Only the top two teams in the men’s and women’s divisions advance, so that’s why Northwestern is able to have two full teams comping for the top prizes in the sport. What they’ve gained through schooling in Alva has definitely paid off. At the intercollegiate level of any sport, the mental approach to the game is vital. That has worked through the rigors of the regular season. He plans to take that same approach when he competes in both events in Casper.